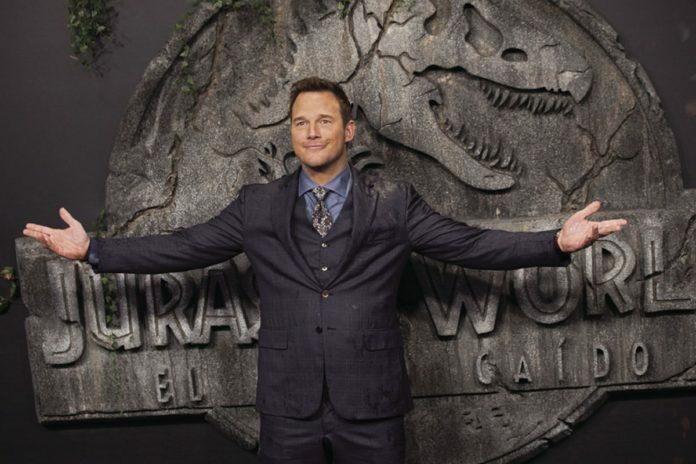 American actor Chris Pratt poses for the media during the premiere of the film 'Jurassic World: Fallen Kingdom' in Madrid, Monday, May 21, 2018. With the end of the school year just around the bend and the Texas heat kicking into its long, sweaty, five-month marathon, the summer movie season this year can be described in one word: gonzo. Exhibiting far less superhero-and-explosion fare than usual (though we will have tentpoles like “Jurassic World: Fallen Kingdom” in late June and “Ant-Man and the Wasp” in early July), viewers eager for an air-conditioned escape will instead find an eclectic blend of mysteries, alternate universes, capers, biopics, and one instance of ribald puppets. June kicks things off with an assortment of films for every taste, beginning with the terrifying “Hereditary,” which premiered at Sundance and gained serious steam at SXSW. Distributed by powerhouse A24 (“Ex Machina,” “The VVitch”), it revolves around members of the Graham family who begin to experience strange and increasingly sinister things after the grandmother dies. Featuring a terrifically terrified Toni Collette as the mother and Broadway vet Milly Shapiro as the beleaguered daughter, Ari Aster’s film is a delightfully creepy start to the summer. Just bring an extra pair of pants to the theater. After you’ve struggled to sleep at night after seeing “Hereditary,” distract yourself with “Hotel Artemis,” about a secret hospital for criminals run by Nurse Jean, played by a scrappy Jodie Foster, and Everest, played by the always affable Dave Bautista who actually does look like a mountain next to her. Resembling The Continental hotel in the “John Wick” series with its strict rules and elite access, the action is spurred by the distrust and betrayals of the underworld patients who enter the secret rooms. With a knife-wielding Sofia Boutella, smooth-talking Sterling K. Brown, and the irrepressible Jeff Goldblum as The Wolf King among other characters, this looks like a crazy trip as the Artemis is gutted from the inside out. After all the cacophony of ghosts and bullets, prepare to settle down and enjoy the halcyon quiet with “Won’t You Be My Neighbor?,” the story of Fred Rogers and his iconic children’s show on PBS. With his trademark gentle voice and manner, Rogers appealed to multiple generations of children who watched his lessons on friendship, tolerance, kindness, and bravery. Never shying away from addressing what his young viewers were inevitably witnessing in their homes, on the news, or on their neighborhood streets, he presented topics such as civil rights and unrest, divorce, illness and even death in a simplified but straightforward way that both connected to and comforted children. Expect many tears to be shed. Films about Los Angeles will always have varying degrees of kudzu intensity, and with “Under the Silver Lake,” writer-director David Robert Mitchell (“It Follows”) has Andrew Garfield’s character, Sam, scouring the city for clues after a dream girl (Riley Keough) mysteriously disappears after their initial meeting. With all sorts of kooky characters potentially holding — or being — the clues that Sam needs to progress further toward finding her, this is part-conspiracy thriller, part-love song to the City of Angels. Relive all your gangly awkwardness with writer-director Bo Burnham’s “Eighth Grade,” as Kayla (Elsie Fisher) just wants to survive her last week of middle school and hopefully start over in high school (who are we to burst her bubble that it only gets worse). Incredibly, Kayla actually looks like a real eighth-grader and endures all the extremes of being a teenager in the digital age, when insecurities can be displayed before the world and reinvention is just a filter away. Joaquin Phoenix, Jonah Hill, and Gus Van Sant unite in “Don’t Worry, He Won’t Get Far on Foot,” based on the autobiography of John Callahan, an erratic and aimless alcoholic who becomes an artist after a car accident leaves him paralyzed from the waist down. With a tight supporting cast including Jack Black, Rooney Mara and Kim Gordon, this is a bittersweet comedy about forgiveness and inspiration. August continues to blend the thrill rides and looney comedies with the dark histories, beginning with Mila Kunis and Kate McKinnon as best friends who get pulled into the international espionage game in “The Spy Who Dumped Me” (still can’t with that title, though). Capitalizing on the success of Melissa McCarthy’s 2015 hit “Spy,” Kunis plays it straight and McKinnon goes all out as they cross continents to deliver a suspicious package. With Justin Theroux and Sam Heughan as the real spies who may or may not be bad — but when you’re that good looking, aren’t you always bad? — the ladies have no choice but to have a good time, whether or not they make it out of Europe alive. In Aneesh Chaganty’s “Searching,” John Cho plays a father desperately trying to locate his missing daughter by combing through her life on social media, the majority of which he was oblivious. Part-thriller, part-commentary on technology’s access to and influence on our lives, it examines how real our online personas are, and how our digital lives both impede and illuminate our realities. Spike Lee’s “BlacKkKlansman,” based on the true story of Ron Stallworth who infiltrated a Colorado branch of the Ku Klux Klan, exploded at Cannes and should be one of the late-summer gems. With John David Washington as Stallworth, Adam Driver as his partner, Flip Zimmerman, and Topher Grace as David Duke, this combines dark humor with evil events, done with Lee’s trademark sense of space, structure and perception. In a film that resembles “Who Framed Roger Rabbit?” meets “Crank Yankers,” Melissa McCarthy and Bill Barretta play rival detectives forced to partner up in The Happytime Murders. Oh, and Barretta voices a puppet character named Phil Phillips in an alternate world of Los Angeles where puppets and humans both live. When the puppets on a children’s show start getting killed, the detectives must work together to find the murderer. With a comedians’ showcase including Leslie David Baker, Maya Rudolph, Joel McHale and Elizabeth Banks, this looks like a raunchy, bizarre, adults-only treat at summer’s end.